January 5, 2017, Washington, DC – The Muslim community has one of the greatest tools to build a cohesive America where no American has to live in apprehension or fear of the other. This is the foundation upon which Islam was built, verse after verse it is suggested that each human is created to be a unique being with his or her own tribe, nation, and community. None is privileged more than the other except his or her deeds. Verse 49:13 suggests that given that uniqueness, conflicts are bound to happen, and then God tells, the best ones among you are those who take the time to learn about each other, and respect the otherness of others (109:6). When we learn about each other conflicts fade and solutions emerge. Prophet Muhammad (pbuh) was committed to peaceful societies and he knew one cannot build peace in vacuum, one has to earn the trust of the society, one has to be truthful, reliable, and trustworthy and around whom others have to be safe and secure. So he lived his life by example and earned the title of Amin from the Jewish, Christian and Pagan and other tribes. 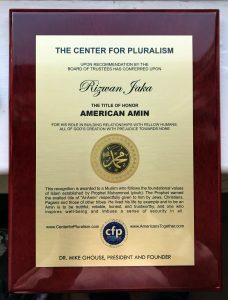 The Muslims were blessed with this model of Amin, and we at the Center for Pluralism are pleased to resurrect this model, and encourage individuals to earn the respect and trust of fellow Americans. What does it take to be the AMIN? We have to understand Islam in its full glory. We recite that God is Rabbul Aalameen, (Creator of the Universe) and Prophet Muhammad is Rahmtul Aalameen, that is blessing to the whole humanity. That makes us a human for the the goodness of all humans. Simply put, a Muslim is some one who embraces the whole humanity, some one who drops all racial, religious, ethnic and other barriers and respects the otherness of others. If we place barriers between us and people from other faiths, races, ethnicities and other uniqueness, then there is something missing in us from becoming a full human, a Rahmat to the Aalameen ( blessing to the universe) in the footsteps of the Prophet, is it not? Would you accept a prejudiced God who favors others and not you or vice-versa? Would you accept a God that makes a deal with you behind other’s backs or vice-versa? Would you limit Prophet’s mercy to part of the humanity or would you ‘allow’ it to embrace all humanity? What holds us from becoming Mukhlooqul Aalameen (all embracing human)? We have been misled by a few scholars from the middle ages that we cannot make friends with Jews, Christians and Pagans. God did not say that or other thing like that ascribed to him. It is time to fix our understanding of God. It is time to understand God’s words to embrace whole humanity. God is about justice, balance, harmony and kindness and does not take sides with any group, he does not stereotype any group that he has created, he is about dealing with each individual on an individual basis. Quran 3:104 (Asad) “And that there might grow out of you a community [of people] who invite unto all that is good, and enjoin the doing of what is right and forbid the doing of what is wrong: and it is they, they who shall attain to a happy state! We are precisely committed to do that. The American Amin Award is being instituted to recognize and encourage individuals who follow the Amin model of the prophet. This recognition is awarded to Muslims who follow the foundational value of Islam: Amin, as Prophet Muhammad (pbuh) was called, i.e., an Individual who reaches out to every human regardless of his or her religion, race, region or other uniqueness for the common good of humanity. God rewards for all the good we (all humanity, not just Muslims) do, and as a society it is our duty to recognize and appreciate the people who make a difference in the communities we live in. Prophet Muhammad ‘s daughter Fatima asked him once, “Dad, am I going to the Paradise straight?” The Prophet says, “No”. She inquires again, “but I am the daughter of the Prophet.” He says, “You have to earn it, deed by deed” and there is no automatic privilege in Islam. A good deed is some thing you do for the other without expecting anything in return. In another verse (5:69) he communicated that, whether you are a Jew, Christian or a Pagan, you need not worry, as long as you take care of fellow beings. What does this mean for American Muslims? It simply means we have to become Amins of the society, and have to be there for our neighbors in their crises, deaths, marriages, births and other celebrations and commemorations. Mind you, neighbors are neighbors. There are many verses in Quran where God consistently talks about caring for fellow beings, his creation. Since it is a premiere award, we felt Rizwan Jaka, Chairman of the Adams Center is the right individual to begin the process and start the annual Awards. He is one of the most sincere guys with least bias towards fellow humans. I have watched him over a period of 18 months, he does not fake welcomes to people of other faiths. His interfaith reach out is genuine and he is sincere. Congratulations Rizwan! I take my hats off for you. Next year, God willing it will be one of the biggest events of the year by and we hope to highlight 50 Muslims from 50 states but will recognize one based on his or her work and the public vote. It is a big responsibility, we are willing to handle. The Center for Pluralism is an initiative of American Muslims, but it is not a Muslim organization. 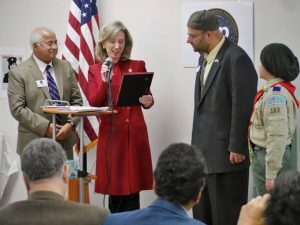 However, it is committed to pave the way for Muslims to become a part of the American story just as it is committed to do the same for others religious groups. If you have an interest in being a part of CFP, there are a few basic requirements you have to meet, number one is willing to shell the arrogance that your faith is superior to the others, religion is about humility and not arrogance, there are six other tests. At least you must be willing to develop the attitudes of respecting the otherness of others and accepting the God given uniqueness of each one of us.